4 Comments Published by Tiffany on Wednesday, October 26, 2005 at 2:07 PM. Sunday morning, we joined the Loughborough Church of Christ for morning worship and a fellowship meal (aka, a potluck). It was so nice to get to spend some time talking to the people there, especially as many of them were headed out of town on holiday, and wouldn't be around for the rest of the week. 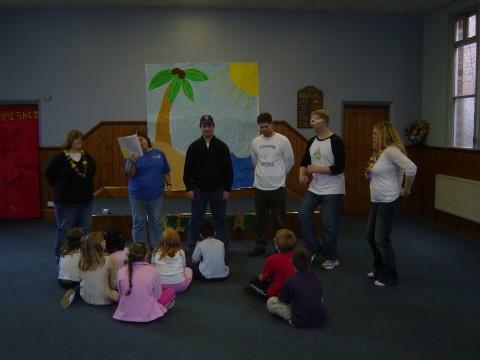 Once we had eaten and cleared up, we jumped into our prep for the HBC (Holiday Bible Club, aka Vacation Bible School). We rehearsed our sketches, prepped for crafts and games, and went to the stores for food and supplies. That night, we had our official HBC kickoff. A short devotional, followed by an introduction to "Ripe" and "Rotten", the main characters of the week. Each day, these two would meet a Bible character and learn about his or her story. The theme was "Going Bananas" - the crazy things people do to please God. So we did Noah (who built an ark in a desert), Gideon (who went to battle against an army with only 300 men), and the woman with the jar of expensive perfume (who anointed Christ's feet with it, washing his feet with her tears and drying them with her hair, as well as wasting an entire bottle of perfume, just to express her love and gratitude for the grace he had shown her). The first night, though, was just a taste. After service, we again had some time of tea, food, and fellowship. The young adults group stayed for a while at the building, and we ordered Chinese food, again from Ming's Kitchen. I'm not kidding about that place. I wonder if they would ever franchise..... Anyway, we ate and played games and eventually went home. No ladies and highwaymen that night. Monday was the first day of HBC. I have to admit to being a bit nervous about how it would all go. We had 18 kids, which was probably the perfect size for us. Large enough that we could do the planned activities (mostly), but small enough that each child got a lot of personal attention and play. I didn't get to spend as much time with the kids as I would have liked, since I was running around doing things, but it was fun, nonetheless. We taught them a bunch of new songs, the most popular being the camp version of "Singing in the Rain" and "The Coconut Song". If you don't know them, don't worry about it. Like every other camp song, they just get stuck in your brain for days at a time. After we cleaned and ate lunch, we helped set up for Afternoon Tea. Each Monday, a group of mostly older church members meet at the building for (duh) tea and goodies, and usually a game or some sort of entertainment. We played a modified version of Trivial Pursuit. I was in heaven. I got to sit with Margaret and John, and with Stephanie, who is feisty and hilarious. After some free time before dinner, during which we were free to wander through town a little, we ate, and then the guys took of for Mark's house, where they spent a great night in prayer and devotion. Oh, wait, I mean watching football (soccer) on TV. Meanwhile, we met with the women of the church for their weekly Ladies' Bible Study. Sheryl led a great discussion on unexpected sources of light and understanding - people who had blindsided us with Christ's love. It was a long discussion, and we ended the night with hymn. There is something so sweet and beautiful about a group of women singing together. We grabbed some ice cream while in town, and went back to Angie's for another viewing of "The Lady and the Highwayman". Seriously, go buy it and watch it tonight. You will thank me. Tuesday started with more HBC. Another day, another lot of fun. After lunch, we loaded up in the minibus (their equivalent of a 15-passenger van), and drove out into the countryside for some sightseeing. First, we went to Mt. Saint Bernard's Monastery. The "attraction" there is a Calvary Walk, which is peaceful and thought-provoking. 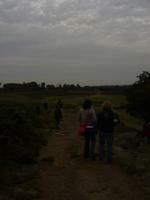 After an hour or so of walking through it, we loaded back up and headed to Bradgate Park. 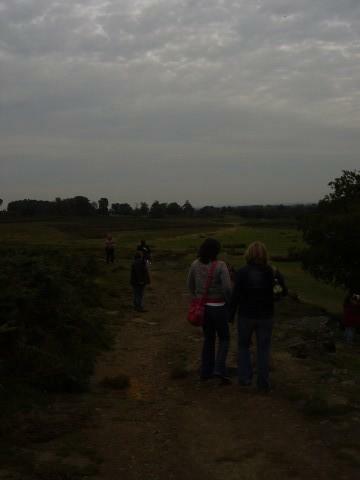 Bradgate is where the family home stood of Lady Jane Grey, who was queen of England for 9 days, just before Mary, Queen of Scots (who got her nickname, Bloody Mary, for her unfortunate tendency to have her rivals beheaded, Lady Jane included). We spent a peaceful hour there. I spent the time mostly alone, listening to music and just thinking and praying. It was exactly what I needed at that point, as I was beginning to get a little touchy. Then back to the building for another amazing dinner, and the weekly Young Adults Night. We played fun icebreaker games, and had a great devotional on the nature of God's plan. Then, of course, more tea and snacks. After a quick but fruitless stop for milk, we headed home for the night. Andy, one of the young women from the congregation, was waiting for Angie to get home. We all went inside and sat around talking and praying until 2:00 or so. No ladies or highwaymen that night, either. Wednesday was our last day of "work". We finished up the HBC, which was over far too soon. The kids really loved it, and we had a blast with it. After lunch, we split into two groups. One group stayed at the building and cleaned out the storage cabinets. The other group, which I joined, went to a local retirement home to visit with the residents. The women there (the only man currently in residence had recently been hospitalized) were sweet, and intelligent, and curious. They asked us a lot about ourselves, but shared plenty about their own lives, too. The house itself is beautiful. The lounge we sat in made me a little bit jealous. I'd love to have a room like that: nice, high ceilings, lots of big windows overlooking the garden, and a big, cozy fireplace. So nice. After some tea and cookies, we stopped at the library to try to use the computers to, you know, post to our blogs and such. Unfortunately, we had no luck, and headed back to the building. After doing a quick cleaning of the bathrooms and auditorium and such, we ate yet another fabulous meal. Oh, and before and after dinner, we shared the wonder of TLATH with our teammates. Kinsey, Phil and Sheryl's little girl, had a portable DVD player that went everywhere with us, so we popped it in for a bit. She later proclaimed it her "favorite movie". She's so smart. Phil led the discussion in Bible class that night. Honestly, I remember that it was really good, and moving, but I don't remember exactly what we talked about. Kinsey fell asleep before church started, and I was holding her through class. I don't get to cuddle much (my boy cousins are too old for such nonsense anymore), so I enjoyed it. I sat with my good friends and praised God. It was a wonderful night. After class was over, of course, everyone stood around and talked forever. Finally, we loaded up and went home. That night, we watched the first half of "Amelie", but were all falling asleep, and so went to bed and got a full night's sleep for once. Then it was on to more fun. Chatsworth, the place we went Thursday, deserves lots of time, as does London, of course, so I think I'll end this post here and come back to those another day. I've really enjoyed reading your thoughts and experiences about your trip to England! My ultimate dream is to travel more and England/British Isles is one of the top places I want to visit someday. Okay, so England's great and all, but I really wanted to hear more about celebrity dreams, as I was not a WATTS reader at that time. So I click back to Celebrity Dreams III and try to go to Celebrity Dreams II - and the link sends me to a Microsoft Exchange web site. Weird. I tried it from home and from work (ssshh). I think your dreams just got even weirder. Hey, I know you don't know me, but I was just looking stuff up online and your site came up on msn.com, you probably don't know that it does. So I'm just commenting. I came across that you met Paul Walker?? You're so lucky. I've always wanted to meet him!